The world is changing, and the change is human-made. In response, we are weaving a new world of community with all beings. We have, in a very short time, degraded the environment so far that some of its creatures cannot survive. The rate of extinctions is speeding up. News of mass deaths, of fish and of bees, is frequent. And still, after many decades of dire warnings, we are still cutting down the rain forests that let our world breathe. But some of us – many of us – are making changes in a different direction. We are re-building community with each other and with the world of Spirit. We are weaving a network of connections that can hold us and sustain us when the consequences of our culture’s train wreck hit home. Creating links with each other and with the beings we share our world with is what The Magic of Connection is all about. These last couple of weeks, I have been part of making that magic in very different ways. The first day of magic happened right here at Westacre. As you probably know, my husband and I are transforming our 1930s house into an eco-friendly home and haven. At the moment, we are working towards installing external wall insulation. The first step in that process is to spray some insulating foam on the foundations, below the damp proof course. For this, we need a ditch to be dug all around the house. While we’re at it, we’re also putting down a path to form a boundary between the EWI and potentially damaging plants. We’re also changing the way drains and waste pipes work. That’s a lot of digging. So we decided to have a digging party. We invited our friends to come and help us for a day, in exchange for food and conversation around the fire bowl in the evening. Eight good souls turned up, and we had a great day. The weather was merciful – dry and not too hot – and we shifted several cubic metres of soil. By the end of the day, we had an efficient team process going, with soil being dug out, transported and disposed of quite fast. It was a joy to behold, and fun to be part of. In the process, friendships were renewed, revived, and nurtured. These are exactly the kind of relationships we need in our changing world: practical and mutually supportive. Last weekend, The Warrior’s Call – pagans united against fracking took part in the fringe events around the OBOD 50th Anniversary Gathering in Glastonbury. Here we made connections that reached further than just human friendships. Sunday was the big day for The Warrior’s Call’s core team. In the morning, we held a stall informing people about our campaign to empower Pagans for the battle against fracking. We held a stall selling clothing with the Warrior’s Call sigil. We’re very grateful for connections made with OBOD members who are fracktivists around the world, and for the financial support Order members gave us. The warm embrace we received from the Order will help sustain our work. 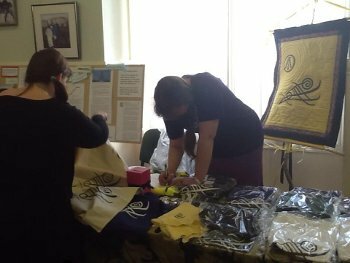 The Warrior's Call stall at OBOD 50th Anniversary, with information and merchandise. Spreading the magic of connection. In the afternoon, Tim and Jonathan gave a talk about Environmentalism and Druidry. They eloquently spoke about Druidry’s long history of social radicalism. As a force for change, it is at its most relevant and powerful when there is a threat to the physical places we love. That was the case with the anti-road movement, and that is happening again with the anti-fracking movement. In this radicalism, Iolo Morganwg stands with us as an ancestor and an inspiration. We still say his Druid’s Prayer at every ceremony of the Order, and remember his bravery in the face of armed opposition when we stand on the front line. It is a connection made across time. After the talk, we invited people to a ceremony at the White Spring. The Warrior’s Call celebrants created a held sacred space in that already numinous place with chanting and drumming. People entered to receive a blessing from Nodens and give a blessing to the Waters represented by the Lady of the Well. People left that enchanted place empowered and invigorated. From its very first ritual below Glastonbury Tor, The Warrior’s Call has had a close relationship with the White Spring. Its Lady, Bridie, and Gwyn Ap Nudd, son of Nodens, were present there nine months ago. A strong connection is being made between our campaign and the world of Spirit. And so we make the magic of connection, and weave a new world within and beneath the old one. It is a world where personal meeting and mutual respect are all important. It is a world where life is celebrated, across time and space.